Pastor Matthew Floyd and his wife, Jen, have a burning desire to spread the clear teaching of the gospel of grace. Both searching for the Lord’s will in their lives, Pastor Matt and Jen met while attending Dayspring Bible College. 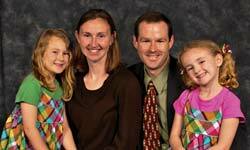 After they married, the Lord blessed them with two beautiful girls, Alyssa, 7, and Courtney, 5. While attending Dayspring, Pastor Matt was a wonderful asset to the Victory In Grace print ministry as the head pressman. The Lord also used him in several different capacities during his 15 years on staff at Quentin Road. His wife, Jen, was a teacher in the Quentin Road Christian Preschool for 10 years. Today, they continue to faithfully serve the Lord at Calvary Bible Church in Osceola, Iowa. The goal of their ministry is to stand strong in the Word of God, to teach and preach its principles to all ages, to win as many souls as possible to Christ, and to equip God’s people for ministry both at home and abroad. Please pray for God’s abundant blessings on the Floyd family as they seek to glorify our Savior.